My Axios colleague Andrew Freedman reports on new research showing why last year's record rainfall from Hurricane Harvey, which flooded the energy epicenter of Houston, is a warning sign. 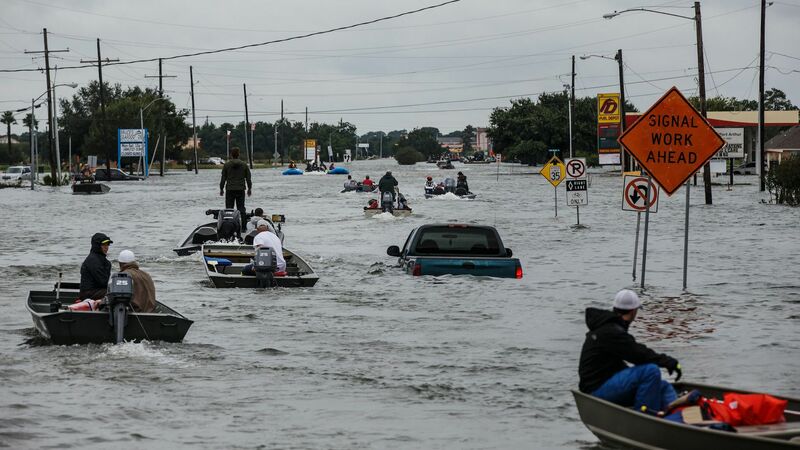 Looking forward: A new study published Wednesday in Nature shows that multiple factors, each of them climate change-related, are raising the risk of similar, meandering hurricanes in the U.S. and other parts of the globe. Global storm slowdown: The study finds that tropical cyclones — a catch-all term for hurricanes and typhoons — move more slowly than they used to. This, combined with the increase in rainfall already expected to occur from such storms as the seas and air temperatures warm, paints a troubling picture of future storms. Go deeper: Andrew's got much more here. Energy implications: The potential for greater flooding is important along the Gulf Coast, home to much of the nation's refining and petrochemical facilities, as well as the location of energy companies and their workers. Last year, Harvey idled a number of refineries, pushed up gasoline prices, affected export infrastructure and generally wreaked havoc in a region that's dotted with vital infrastructure. Axios' Amy Harder reports that while President Trump is asking his administration to bolster economically struggling coal and nuclear power plants, it is concern over coal that's really driving decisions. Speaking of coal: Per The Washington Post, "Trump officials have taken actions that closely resemble measures contained in drafts of half a dozen executive orders and other proposals submitted by coal tycoon Robert E. Murray in the early days of the administration, according to documents released by the Energy Department." Tesla's shares surged by nearly 10% on Wednesday, the first trading day after CEO Elon Musk said the company was on pace to meet targets for Model 3 production and shareholders rejected a dissident move to take away his dual title as chairman. Why it matters: Per my colleague and careful Tesla-watcher Steve LeVine, Musk's rosy Model 3 outlook will be helpful if the still-unprofitable company, which is spending money fast, needs to return to capital markets for more financing this year. Musk has said that won't be necessary, but many analysts expect him to seek more cash as early as the third quarter. One level deeper: Via MarketWatch, the bump in stock price was the Silicon Valley electric automaker's biggest percentage gain since November of 2015, and the $319-per-share close was the highest since mid-March. Quick take: Production of the Model 3, a product vital to the company's future, has suffered a series of problems, and Musk has made over-optimistic claims before, so it's way too early to conclude the company is in for smooth sailing. Speaking of electric vehicles: Reuters reports, "Daimler AG unveiled on Wednesday an all-electric big rig truck it promises to have in production in 2021, as the German automaker mounts a major challenge to European and American rivals, including new entrants like Tesla Inc."
4. Climate advocacy "vastly underfunded"
Let's revisit a topic we covered last month — a study on major philanthropies' climate and energy-related funding from 2011–2015, which showed few resources devoted to pushing carbon capture and none to nuclear power. What's new: Inside Philanthropy chatted about the controversial study with Jonathan Pershing, the environment director at the heavyweight Hewlett Foundation. Why this matters: Foundations play an important role in shaping and supporting the environmental movement's work on energy and climate change. Big picture: Pershing agreed with some aspects of the paper by Northeastern University's Matthew Nisbet while also offering some criticism, arguing that the analysis "misses a bigger point" about climate funding overall. "The fact is that across the board, climate solutions and advocacy are vastly underfunded. Climate and clean energy solutions and policy advocacy still represent only 2 percent of total philanthropic giving," Pershing tells Inside Philanthropy. Changes: Elsewhere, Pershing delves into something that's also discussed in the paper, which is how giving patterns have shifted in the last few years. “We are among the few foundations that support work on carbon-negative and zero-carbon energy technologies, including [carbon capture and storage] and nuclear, and we would certainly urge others to elevate these portfolios," Pershing said. Axios' Alison Snyder reports Americans rank monitoring Earth's climate and detecting asteroids and other objects that could hit the planet as top priorities for NASA, according to a new Pew Research Center survey. Lowest on the list: Returning astronauts to the Moon — a top priority for the White House. The context: NASA plays a major climate monitoring and research role. The poll was conducted two months ago but arrives just after new NASA Administrator Jim Bridenstine, in a split with other key Trump administration officials, openly endorsed the dominant scientific views on human-induced global warming. Resources: As the chart above shows, 34% of adults polled say seeking raw materials and resources that could be used on earth should be a top priority. Go deeper: Read Alison's full story in the Axios stream. Tapping the brakes on solar: Greentech Media looks at the fallout from the Chinese government's decision to dial back generous support for solar power expansion in the largest market for the energy source in the world. "In all, the changes will significantly chill growth in a country that’s driving the global solar market," they report. Reuters notes how the changes are causing the stocks of solar companies to take a hit. Global transmission aims: A fascinating new Financial Times piece looks deeply at China's aggressive investments in ultra-high voltage transmission technology, in part as a way to re-allocate power surpluses from Chinese-built projects in Laos and elsewhere. "Some western observers see a geopolitical strategy on a par with China’s Belt and Road Initiative, a grand design that seeks to boost Chinese-led infrastructure investment in more than 80 countries around the world," the story notes. New record: Via The Wall Street Journal, combined U.S. oil, gas and fuel exports reached a record high in April. "The country shipped $19.9 billion in petroleum — a category that includes crude oil, liquefied gases and fuels such as gasoline — to other countries in April, the Commerce Department said Wednesday," WSJ reports. New competition: Bloomberg looks at how Asian buyers of U.S. crude, which sells at a discount to other key grades, are "about to face stiffer competition as the U.S.’s own demand rebounds, with domestic refineries restarting after spring maintenance." OPEC: Per CNBC, "The forthcoming meeting between OPEC and non-OPEC oil producers, including Russia, could be one of the most fractious in recent years with competing interests and demands at play, according to oil market experts." Changing places: Royal Dutch Shell ranks first among oil-and-gas majors in the newly released Forbes Global 2000 list of the world's largest public companies, placing ahead if Exxon in a switch from last year. ICYMI: Two of Scott Pruitt’s closest aides gave notices that they are leaving the Environmental Protection Agency amid mounting backlash over the embattled administrator’s spending habits and management, the Washington Post reports. A source with knowledge of the matter has confirmed the departures to Axios. The details: The two aides leaving are Sarah Greenwalt and Millan Hupp. The agency didn't respond to request for comment on the resignation of Greenwalt, a senior counsel. However, Pruitt told the Post in an emailed statement that Hupp, his top scheduler and travel planner, is "a valued member of the EPA team from day one, serving an integral role in our efforts to take the President’s message of environmental stewardship across the country." The intrigue: One unknown is whether the latest turmoil, not to mention new and rather strange revelations about Pruitt's behavior, will change the White House calculus on his status. Thus far, Pruitt has weathered the scandals and retained Trump's public backing. Just yesterday, at an event at FEMA headquarters on hurricane season preparations that Pruitt attended, Trump said EPA is "doing really, really well." "And you know, somebody has to say that about you a little bit," Trump told Pruitt.